From the original Herald article. When we transcribed this original story below, we only lightly edited in some cases for correction of spelling or to provide continuity. We have been looking for the story behind Catherine Pulsipher for 12 years. We finally found major parts of it in 2002, courtesy of Barb Thompson, a descendant of George Savage of Birdsview, and her cousin Dan Royal. Barb now lives on part of the original Savage homestead, south of the Skagit river near Mill Creek. She has carefully maintained many of the original family documents and photos, especially those of Catherine, who was one of Skagit county's finest writers and a veritable salt of the earth. This is the first of a series of stories we plan to share about the wonderful Savage family, who moved to the Birdsview area in 1878.
with a zest for life? By Doris Norris, Skagit Valley Herald Special Edition 1970 How does one catch a blithe spirit on paper? 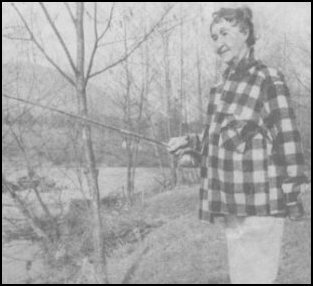 How does one capture in black and white a young woman of 78 who thinks nothing of hiking several miles every day, of shooting her own deer each fall and fishing for her own breakfast? And how does one include in this written picture a poet and historian? Catherine Pulsipher, born in LaConner in 1892, has a zest for life many younger people might well envy. She hikes because she loves to commune with nature, and to test her ability — just to prove she can. 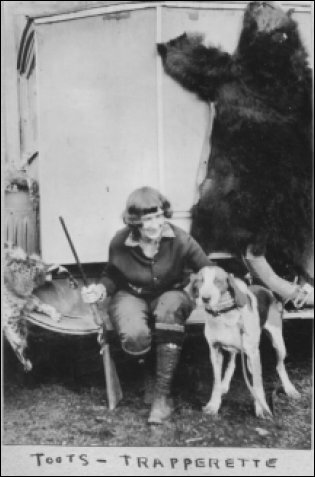 Although she admitted that she didn't have any luck last deer season, in her day she has not only shot deer, but mountain goat and bear. And few are the seasons that she hasn't bagged her game. Mrs. Pulsipher's parents, [George and Georgetta] Savage, are among the area's earliest pioneers, and her older sister, Olive, was the first white child born at Utsalady, an early lumber camp on Camano Island. Her father owned and operated several different lumber mills in the area, and she and her husband, Henry, live on the family homestead near Mill Creek, [which is east] of Day Creek on the south bank of the Skagit river. [This is near where] her father had a sawmill. As a child, she lived in the Socialist [Equality] Colony on Bow Hill, where her father had a contract to log, run the mill, put out lumber and build cabins. She is now helping Ford Smith of Everett write a book on the history of the rather famous colony. Up until 1952, when the Dalles Bridge was constructed, the only way the Pulsiphers could get to their home was by rowboat, and then by ferry, which carried some 400 loggers across the river each day. The ferry now resides, dry-docked, at the county park at Rockport. 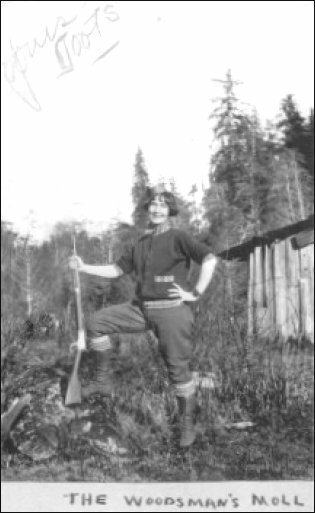 After her father's death, Catherine helped her sisters and mother run a boarding house for loggers, and in 1913 she met and married one of the boarders, Henry [Happy] Pulsipher, a brakeman on a logging train. The couple moved from one logging camp to another until their daughter, Zola, started school. The family put down roots in Bellingham until she graduated from high school. 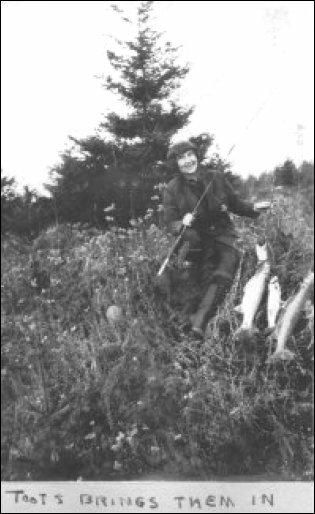 Most of the time since then, Catherine has made her headquarters at Mill Creek, where she can wander up and down old lumber roads, fish out the front door (practically) and hunt out the back door — more or less! She also cares for her many flower beds, while her husband raises vegetables and chickens. And during her free time she writes poetry, sometimes contributing to the Sonnets and Satire column in the Skagit Valley Herald. She admits that she hasn't taken too many overnight hikes lately. Last summer she and her daughter hiked up Cascade Pass and back, and several summers ago they backpacked into Holden, a trip that took about five days. It isn't that she no longer thinks she can — she just hasn't had the time! Thyself through outdoors let me find. God of the Sunset, let me be strong. To keep ever the stars in view. Those who knew and loved Catherine called her "Toots." Click on these thumbnails for the full-sized photos. All these photos courtesy of Barbara Thompson, a granddaughter of Bert and Kate (Halladay) Savage; Bert was one of George Savage's sons and a brother to Catherine. The photos are from a scrapbook maintained by Catherine's daughter, Zola, and the scans are by Dan Royal. His great-great-grandfather, Capt. L.A. Boyd, was Savage's brother-in-law. Boyd and his family joined Savage at the ranch in 1883. Dan's great-grandmother, Mabel Boyd Royal Steen, along with Catherine, is to be congratulated for leaving such an extensive taped and written record of the combined families. Dan Royal has a great newsletter for the Boyds, Royals and Savages, plus their related families. You can email him at dmoroyal@earthlink.net for copies or to contribute material for the site. We plan to share more of Catherine's magnificent writing and historical anecdotes in the near future. If you have any photos, scans, documents or memories to share for this section, please check the contact information below. A 1971 letter from Birdsview pioneer Catherine Savage Pulsipher that reveals her identity as Mountain Katy in June Burn's book, Living High. Would you like to buy a country church, pews, belfry, pastor's quarters and all? Email us for details.